I don’t care that it looks like the cloud of suspicion hanging over that Arizona red warbler is about to break out into a downpour of doubt. I’m still enormously jealous; whether it turns out that the tropical beauty flew from southern Mexico or it crossed the border in the backseat of an Altima, I will forever regret not having seen that flash of red in the ponderosa pines of Rose Canyon. If the bird is eventually adjudged a plausibly “natural” vagrant, it will represent the first generally accepted record of the species north of Mexico — a very carefully qualified formulation that reminds us that the red warbler had a firm place on official lists of the birds of the United States for nearly sixty years before it was definitively removed in 1910. 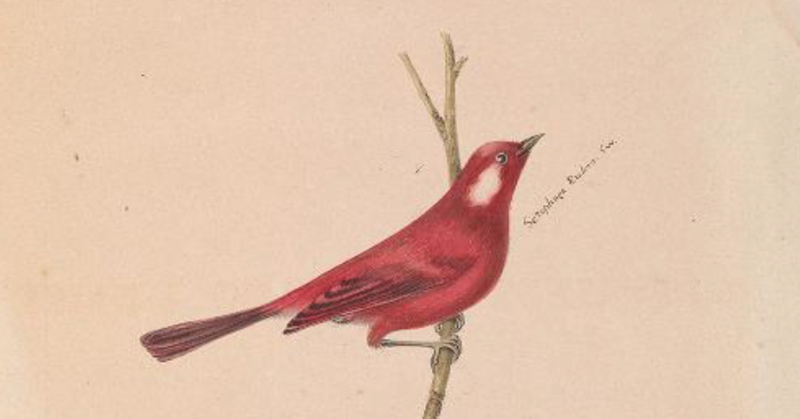 Like so many Mexican birds, the red warbler was introduced to western science by the William Bullocks, father and son, as part of their London exhibitions of zoological and anthropological curiosities. Wildly successful for a while, the show eventually, inevitably, lost its appeal, and Bullock, Sr., sold the collection in a famous series of auctions. Before the birds went on the block, however, he made at least some of the specimens available to William Swainson, who formally described and named the new ones in the Philosophical Magazine for 1827. Swainson gave Setophaga rubra a clear and straightforward diagnosis: the new Mexican warbler, collected in Michoacán, was “entirely red,” its “ear feathers of a silky whiteness.” No mistaking this for any other bird. That original description was translated into German in the Isis, and Swainson himself repeated it in his 1838 Animals in Menageries, this time based on a specimen in his own collection from Toluca. A colored plate of the bird, based on an uncharacteristically clunky painting by Jean-Gabriel Prêtre, was published in 1836, accompanying Frédéric de Lafresnaye’s description of what he thought was a new species, the vermilion warbler, brought back from Xalapa by “Mme Salé” (presumably Cathérine Caillard Sallé, mother of the natural historian Auguste Sallé). Charles Bonaparte corrected Lafresnaye’s error a year later, pointing out that the Xalapa bird was in fact identical to Swainson’s — but committing a lapse of his own in including Guatemala in the species’ range. And it wasn’t over yet. More than a decade after William Swainson brought the red warbler to the notice of the scientific world, the New York collector Jacob P. Giraud received a shipment of bird skins from Texas, fully sixteen of which represented what Giraud thought were new species. Among them were a striking little creature that Giraud named the white-cheeked titmouse, Parus leucotis. The accompanying plate (at the top of this blog ‘post’) was by A. Halsey, an illustrator far less famous than the engraver, Nathaniel Currier. an observation affirmed “without doubt” by Philip Lutley Sclater a dozen years later. The truly spectacular aspect of Giraud’s specimen, though, was not the bird’s identity but its origin. Giraud did not secure his type himself, but is quite clear that he acquired it from someone else, most likely his usual New York dealer, John Graham Bell, who was also the collector’s taxidermist of choice. Giraud took Bell at his word as to the provenance of the Texas shipment, thus inspiring a poorly documented but nevertheless obviously vehement argument about those sixteen “new species” that would go on for a full forty years after Giraud’s death in July 1870. The propriety of introducing this species into the fauna of the United States is questionable. No specimens have as yet been found even as far north as northern Tamaulipas, in Mexico. As one of the birds described in Mr. Giraud’s work, however, it is entitled to a notice. Others had greater confidence in Bell and Giraud’s assignment of the red warbler to Texas. John Cassin in Philadelphia regretted that “no one of the several American naturalists who have visited Texas” since 1841 had seen the bird, but had no doubt that the Giraud specimen had come from there. Robert Ridgway, Baird’s protégé and eventual successor in the Smithsonian’s bird room, listed the species without comment in his 1881 Nomenclature, though six years later, in the Manual, he queried its assignment to southern Texas. In 1882, Elliott Coues denied the species a place in the main body of his Check List, but in the introduction expressed his belief that it had “doubtless” occurred north of the Rio Grande and could be expected to do so again — a notably more positive assessment than he had given the Giraud record in 1878. Perhaps the most remarkable document to have come down to us in the matter is a paper published in the Ornithologist and Oologist for 1885 by Wells Cooke, in which Cooke argues vigorously for Giraud’s bona fides. Considerable doubt has been expressed by ornithologists … but the recent great extension of our knowledge of the avifauna of the Southwestern United States is tending to inspire confidence in Giraud’s record. Mr. Henshaw has at last determined … is a tenable variety found only in Texas. Here we have a very strong argument in favor of Giraud’s good faith. That Giraud’s at present unconfirmed species of Texan birds be included in the List on Giraud’s authority. This, of course, included the red warbler, assigned AOU number 691 and its habitat given as Mexico and Texas. The committee responsible for the second edition of the Check-list, published in 1895, expressly reasserted the appropriateness of including Giraud’s Texas species, and our warbler is right there in the same place it had occupied a decade earlier. to be expunged from the List, as based exclusively upon Giraud’s unconfirmed “Texas” records. The AOU’s striking of the red warbler was greeted with general relief. Writing two years after the publication of the third edition of the Check-list, John Kern Strecker noted with snide satisfaction the discrediting of “Giraud’s ‘Texas’ species which should have long ago been excluded from the A.O.U. Check-list,” among them the red warbler. More recent works on the birds of Texas are unanimous in rejecting the species as a genuine member of the state’s wild avifauna: Oberholser calls its occurrence north of the Rio Grande “exceedingly questionable,” and neither edition of the T.O.S. Handbook so much as mentions the bird. The red warbler is gone, off the table, vanished from Texas birding. But the indisputed occurrence — whatever its circumstances — of the bird in Arizona last week reminds us that it once loomed more prominent on the horizon of American ornithology’s expectations. Who knows? It might someday again. Audubon’s famous Fork-tailed Flycatcher, collected in New Jersey in June 1832, gets all the press. But that wasn’t the first fork-tail recorded in the US — or even, amazingly enough, the first for New Jersey. a beautiful male, in full plumage … was shot near Bridgetown, New-Jersey, at the extraordinary season of the first week in December, and was presented by Mr. J. Woodcraft, of that town, to Mr. Titian Peale, who favoured me with the opportunity of examining it. 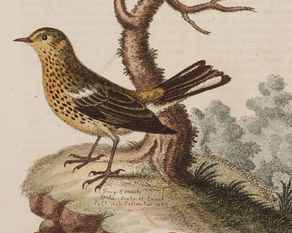 “Me,” of course, is Charles Lucian Bonaparte, writing in his American Ornithology, for which Peale also provided the rather stiffly elegant plate reproduced above. 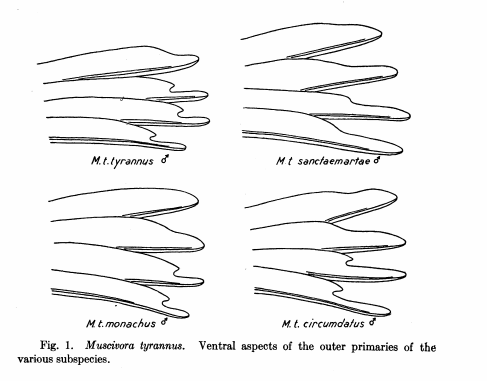 … the three outer [primaries] have a very extraordinary and profound sinus or notch on their inner webs, near the tip, so as to terminate in a slender process. That is enough, according to Zimmer, to identify the Woodcraft specimen as a member of the subspecies savana (then known as tyrannus). That austral migrant, abundant in its range, is responsible for almost all northerly records of this species, though Zimmer identified one New Jersey specimen, of unknown date and locality, as sanctaemartae (a determination adjudged only “possible” by Pyle). Now here’s a true mega: A Cape May Warbler, the second for Britain, is being seen on Unst, that delightfully named island in the Shetlands. Interestingly, the ornithologist who first discovered the species, Alexander Wilson, was born and spent his youth in Paisley…. But our warbler had been known to science for half a century by the time Wilson learned of its existence. 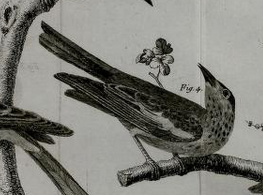 In 1789, more than two decades before Wilson put pen to paper about what he mistakenly considered a “new and beautiful little species,” Gmelin knew the bird — and gave it the nicely descriptive name Motacilla tigrina in his edition of Linnaeus’s Systema. The real eye-opener here is — or should be — all the earlier citations Gmelin is able to adduce. 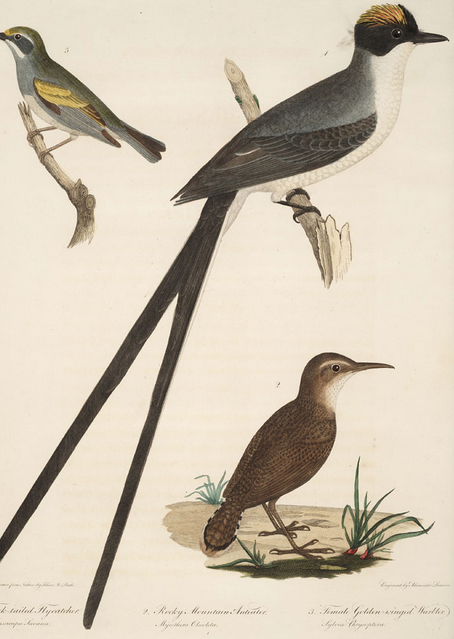 Edwards, Brisson, Buffon, Pennant, and Latham had all described this warbler in the mid- and late eighteenth century, a couple of their accounts even accompanied by paintings. So much for the notion that Wilson — who died 200 years ago this year — was the “discoverer” of the species. This new and beautiful little species was discovered in a maple swamp, in Cape May county, not far from the coast, by Mr. George Ord…. Of this beautiful species, which was first described by Wilson, very little is known…. I am indebted for the fine specimens … to my generous friend Edward Harris…. Now there’s an irony. Audubon devoted so much energy to denying Wilson‘s priority in other cases, but here, thanks to his profound disdain for George Ord (or to sloppy reading and even sloppier bibliographic work), he created a myth that is still being retold nearly two hundred years later. But we all know better. Three cheers for Edwards and the rest! There are some great birds on this week’s Arizona RBA, everything from Sinaloa Wren to Yellow-throated Vireo, from Ruby-throated Hummingbird to Plain-capped Starthroat; but what has most caught the eye of discerning locals is the report of a very young juvenile Short-tailed Hawk above Madera Canyon. This is still a very rare species in the southwestern US, and the thought that this bird might have been hatched in the Santa Ritas is an exciting one, potentially extending the breeding range of the species quite a ways north and west from its strongholds (a relative term in connection with a bird this scarce!) in the Chiricahuas and Huachucas. There can be no doubt about the identification, of course (the observer is one of the very best), but it is nice that he was able to photograph the hawk, too. And here’s where things get interesting, to me at least. The RBA, well and conscientiously crafted this week by a couple of excellent and thoughtful birders, pronounces this photograph the first “physical documentation” of the species in the Santa Ritas. Wait a minute. “Physical”? Did Dave shoot the poor thing? Of course he didn’t. What the compilers meant to do here was to contrast photographic documentation and written documentation. I won’t belabor the fact (as I usually do) that photographs should be viewed as only supporting material for written documentation, but I will point out that there is nothing “physical” about a photograph–or a sound recording–or at least, that whatever “physicality” those forms of representation participate in is shared by written documentations. What’s “physical” and what’s “immaterial” in this photo? It’s my belief, my assertion, my unyielding insistence that only the paper-towel-shrouded corpse (a House Sparrow that gave its life, reluctantly, for science) is ontologically “superior” to the written documentation, and that the photo on the cd and the image on the slide and the recording on the cassette tape (remember cassette tapes?) are in fact less “physical” than any of the other objects and artifacts they share the screen with. Anyone who disagrees with me is, hm, wrong. Obviously, I hope that my readers (both of them) are skilled at detecting irony and (slight) overstatement; but I’m equally hopeful that someone “out there” will propose a better, more precise formulation than “physical documentation” for the sorts of evidence represented by photographs and sound recordings. Be prepared: I’ve already thought of the obvious alternatives, and am ready to reject them all with vehemence. A big smile for the rest of the weekend!